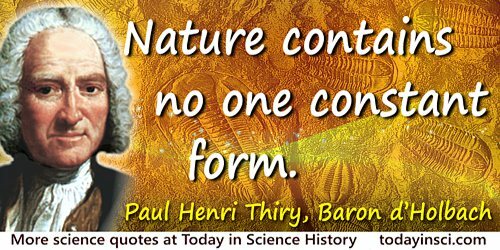 German-French philosopher of science who was also one of the first European self-declared atheists. 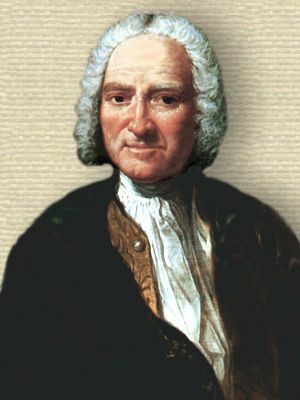 His most famous book, Le Système de la Nature (The System of Nature), was published in 1770, under the pen name of Jean-Baptiste de Mirabaud. Men always fool themselves when they give up experience for systems born of the imagination. 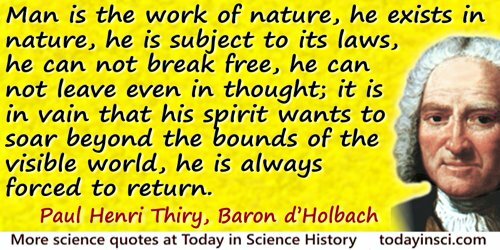 Man is the work of nature, he exists in nature, he is subject to its laws, he can not break free, he can not leave even in thought; it is in vain that his spirit wants to soar beyond the bounds of the visible world, he is always forced to return. 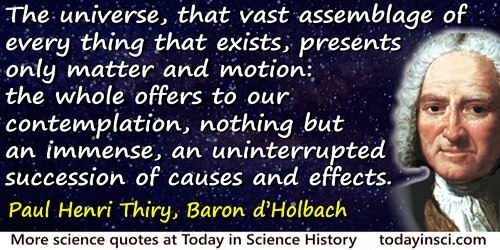 The universe, that vast assemblage of every thing that exists, presents only matter and motion: the whole offers to our contemplation, nothing but an immense, an uninterrupted succession of causes and effects. 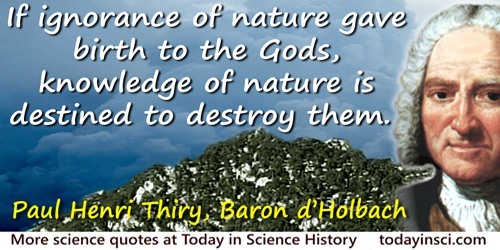 The System of Nature (1770), trans. Samuel Wilkinson (1820), Vol. 1, 12-13. 8 Dec - short biography, births, deaths and events on date of Holbach's baptism.